Crafty Tidbits: She's baaaaack. . . .
She's baaaaack. . . .
Yessiree, she is indeed back. I’m feeling my mojo returning. I just hope it’s back to stay. Just when I think I’m ready to call it quits on crafting and sell up, the urge hits again. The card isn’t wonky, but the photo is! 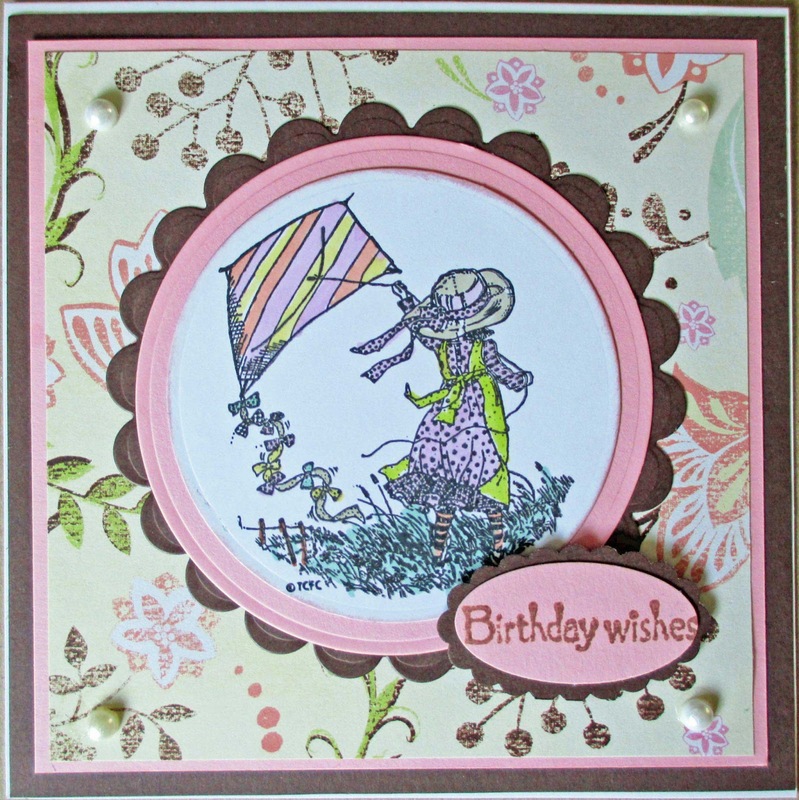 Anyway, this is a “card lift” from the July issue of Cardmaking and Papercraft magazine. The stamp was free with the magazine and the card I used was originally designed by Caroline Knott. Hers must be an 8x8” as I couldn’t get everything to fit – she had two patterned papers and . She had some beautiful designs in this issue and I highly recommend them! 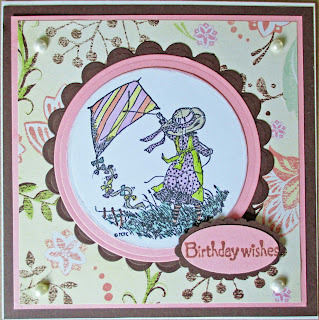 For the large scallops and circles I used Spellbinders Nestabilities dies. For the sentiment, I used my Stampin’ Up punches. The patterned paper is an older one (can’t remember the name) and the solid cardstock is Stampin’ Up. To color the image I used my ProMarkers. The Promarker colors actually are identical to those in the paper, but don’t look like it in the photo. Now a word about cards. I recently purchased a huge supply of card blanks with envelopes. The manufacturer is Craft UK Limited.I bought white and cream, 6x6” and 8x8”. Well, WARNING… the sizes are very much OFF the sizes as sold. The 6x6” are just 5.75” if that! Now that little quarter-inch may not seem like much until you are trying to measure and cut your paper for layers before adhering it to the card. As you can imagine, there was a bit of wailing and gnashing of teeth when I realized (using American spelling here, folks, as I’m in a hurry to get this done) I’d have to re-cut everything! Actually the one I think I want is much larger than this (about 16 x 10 ft) and has bigger windows, but this is the general idea. And…. drum roll…. 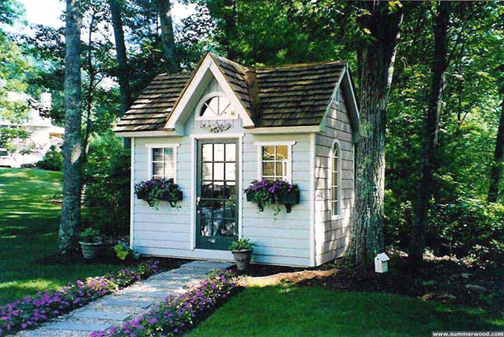 it won’t need planning permission, either. What do you think?